This is one of my masterpieces. Like many dinners previously, it was borne out of one ingredient that was found in the freezer. In this case, it was some diced cubes of beef. The flatmate and I thought long and hard, and finally decided we would be ambitious and attempt the oh so delicious boeuf bourguignon! After my French cooking class at L’Atelier des Chefs, I felt I was ready to attempt another French classic, and so I did some research and acquired the necessary ingredients. Most of the recipes I found were quite complicated, as this is not an easy dish to make. Unfortunately, unlike the lamb tagine I made a while back, this isn’t one of those ‘stick-it-all-in-the-slow-cooker-and-wait’ recipes, as everything needs to be pre-cooked. It feels a bit like cooking it twice, but trust me, it’s worth it! I have tried to make my recipe easier to follow with very clear instructions for all the steps of the process and ingredients. I mostly based it on this recipe by The Kitchn, but made a few small changes (as I always like to do!). Also, most of the examples I found online include the addition of ‘pearl onions’ (the ones used for pickling) as a garnish (à la Julia Child), but I couldn’t find those anywhere so they had to be omitted. I served this hearty stew simply with some baguette (très français) and made some simple green beans on the side (with a dash of Creole salt, lemon juice and butter). Delicious! 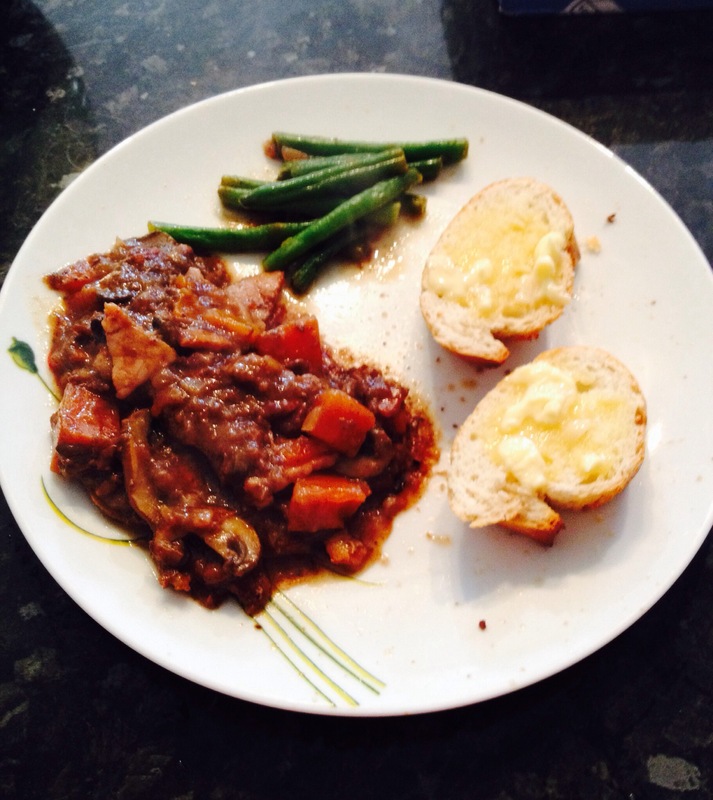 The red wine just brings out all the meaty flavours, and the slow cooker infuses everything beautifully. The most fascinating thing for us was how the onions seemed to just disappear after having been slow cooked. Seriously, where did they go?? Prepare all the vegetables: peel and slice the onions (slices are best, as they’ll fall into rings/strips when you fry them), peel and finely chop the garlic, peel and chop the carrots and slice the mushrooms. Cut the bacon into pieces with your kitchen scissors. 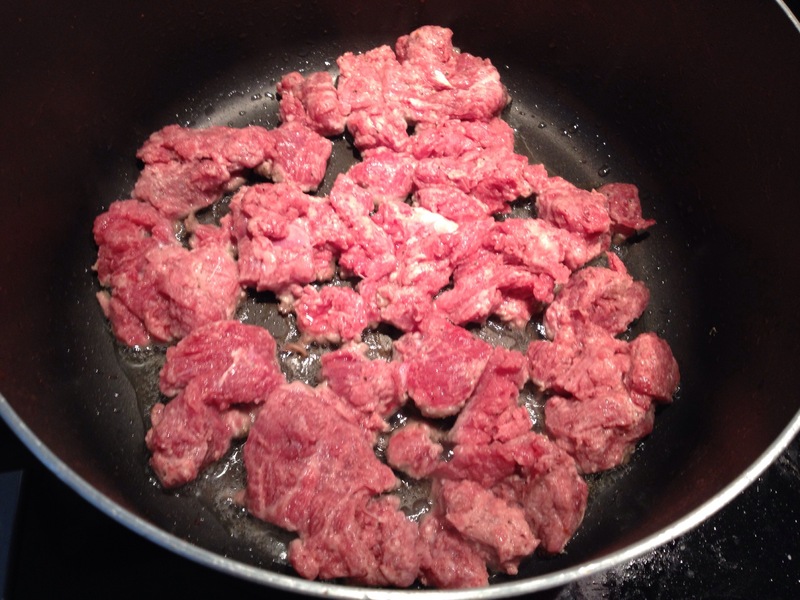 In a bowl, mix the beef pieces with the cornflour, salt and pepper. Bacon: I like to use my large, deep-bottomed pan for all the frying as it’s easiest. Heat it without any oil or fat and add in the bacon. Fry it until it’s crispy (5-7 minutes). 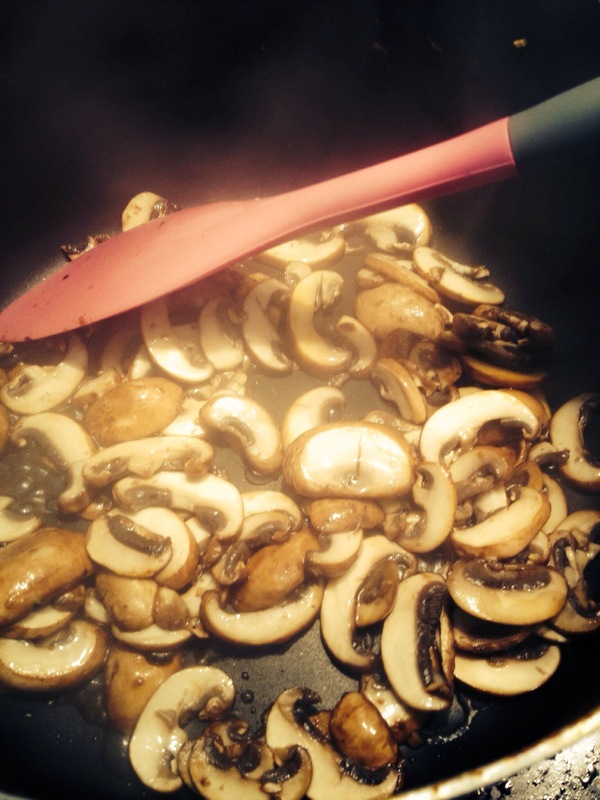 Remove from the pan with a slotted spoon and put on a plate with a kitchen tissue to soak up the excess fat. Pour off the bacon fat from the pan into a small bowl. Beef: Put 1 tbsp of the bacon fat back in the pan and sear the meat. This means you should put all the meat in the pan in a single layer and let it cook for about 2 minutes before turning and letting sit for another 2 minutes. This is also why I like using my big pan, so that I didn’t have to do the meat in batches, but could do it all at once (if your pan is too small, you’ll need to sear the meat in batches and add a bit more fat each time). Once you have seared both sides, transfer the beef into the slow cooker. Wine: Pour the 80ml of red wine into the warm pan, scrape off any excess bacon/meat from the bottom, stir it around and then pour over the beef pieces into the slow cooker. Vegetables: Add in 1 more tbsp of bacon fat (if you run out, just add some vegetable oil) and fry the onions with 1/2 tsp of salt on medium-high for almost 10 minutes, stirring frequently. They should turn soft and slightly brown. Then, add in the carrots and fry for 3-4 more minutes. Then add the garlic and tomato puree, fry for another 2 minutes and add into the slow cooker along with the beef. You should have the beef, some wine and the vegetable mix inside. Now, add in the 320ml of red wine, the water, beef stock cube and bay leaves along with another 1/2 tsp of salt. Turn the slow cooker to ‘low’, close the lid and let it sit for 8 hours. Don’t open the lid! Fry the sliced mushrooms on medium-high heat in more bacon fat / vegetable oil until they are soft and all the liquid has evaporated. Keep aside with the bacon pieces. These two things will be added in at the end. After 7.5 hours, open the lid of the slow cooker and stir in the bacon and mushrooms. Leave for another 30 minutes. Then serve with some fresh baguette, smeared with garlic butter (I made this quickly by using some soft butter, chopped garlic and salt – stunning)! 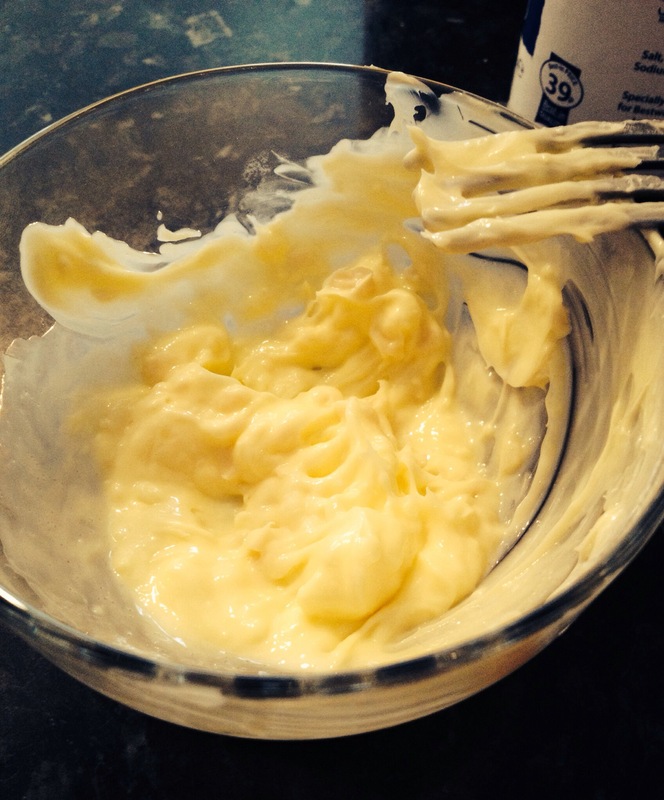 The garlic butter – my flatmate referred to it as ‘butter of kings’!